Did you know you can get inside Lord Jabu Jabu as adult link? It’s quite easy too! You literally just walk inside! After seeing this glitch preformed numerous times online I decided to take a swing at it myself. I don’t know how Grezzo overlooked this, it’s quite embarrassing on their part, but on the bright side we’re starting to build up a very impressive library of glitches in Ocarina of Time 3D . And there you have it! Just walk up that little patch of ice into the invisible, but very alive Lord Jabu Jabu. Shame on me for thinking he died after Ganondorf ravaged the lands of Hyrule. Have any of you out there done this as well? 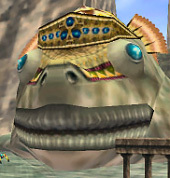 What are some of your new favorite glitches in Ocarina of Time 3D? Leave a comment and let me know! And Yes, I know, I make Link look like a drunken fool.